A friend send this link to a video about the new mi Adidas Innovation Center in Paris. Adidas, which was one of the early brands in SecondLife, is demonstrating their innovation abilities in the real world with this new store. The have blended Entertainment, Education, Co-Creation, and 3D-Virtual technologies into an exciting, interactive retail experience. With just a few steps walking and running on a catwalk-style scanner, foot and pressure sensors analyze shape, size and pressure points. Customers enter details like color and accents on a large touch screen. An interactive “virtual mirror” (recently on Gizmodo), allows the user to try on their personalized shoe (or any other shoe) without taking off their own. And last but not least, the new scan table picks up RFID technology embedded in the shoes to display specific product information. The purpose of the store is two-fold. Adidas has always been about innovation and they want to use this retail platform to showcase that. They also want to attract a younger demographic and believe the highly interactive nature of the store will be appealing to younger customers who have “been brought up on video games”. Is all this technology to sell sneakers just a gimmick? I don’t think so. Look across the sports world today and you will see that technology has been incorporated everywhere in an attempt to boost performance. And it’s not just for the pros. The biggest market for sports technology are the amateurs who want to excel in their particular sports passion. Everything from real-time vital signs monitoring to the latest in golf club design is eagerly scooped up by the sports enthusiasts. If you are in the sports shoe business, an interactive, technology-based experience store might be just the ticket to driving brand engagement. 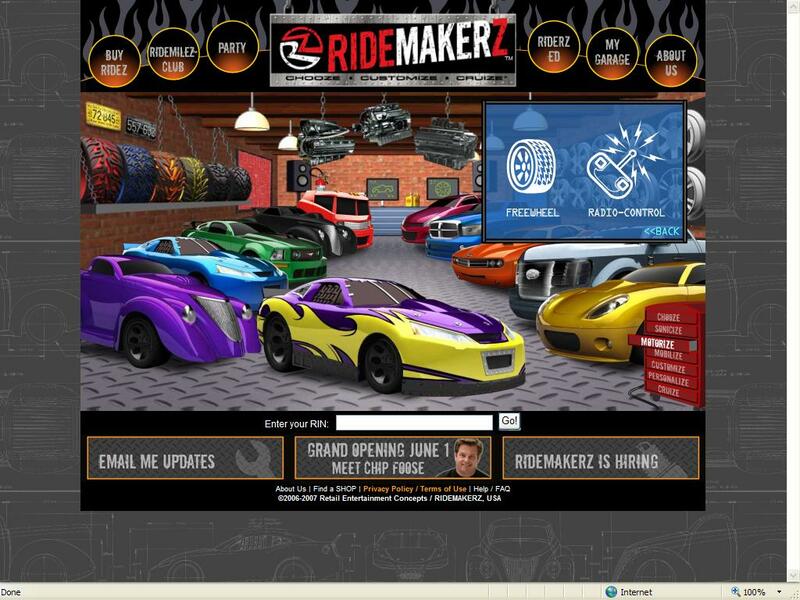 Ridemakerz: This is also cool!!! With funding from Build-A-Bear, this new store is hoping to do for toy cars what the aforementioned chain did for stuffed animals. Hoping to offer a bonding experience for fathers and sons, the store will enable customers to create custom toy cars by selecting the type of car, body style, paint and sound effects, and locomotion style. Additional accessories ranging from decals to tire treads will also be available. The first Ridemakerz store opens on Friday in Myrtle Beach, South Carolina, with a second store opening planned for July in the Mall of America. I predict this will be hot! Check out the website and see what I mean. Entertainment experiences are increasingly becoming multi-channel. If you are addicted (like me) to ABC’s Lost, know that there is much more to the show than the weekly episode. From the show itself to its official website, fan message boards, fake commercials, mini-sites that detail the lives of the characters, text-message updates, podcasts, newsletters, print magazines and more, Lost is a useful example of engagement, fan involvement and how to leverage new media for an integrated campaign. Recently, industrial rockers, Nine Inch Nails released “Year Zero”. An alternate reality game has emerged to promote the album’s concept. Clues hidden on tour merchandise have led fans to discover websites that continue the story started on the album. Year Zero songs were reportedly found on thumb drivesin the bathroom stalls of NIN concerts in Europe, which the band itself covertly distributed ahead of the music’s official release. Fan participation in this alternate reality game has garnered a high level of media attention and led to the creation of fan-sites & clubs, Forums, and Wikis as sources for new discoveries. 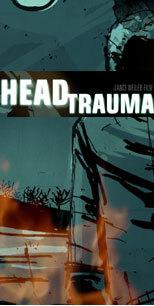 Yesterday, I read about Director Lance Weiler’s “remix” presentation of his cult indie horror flick Head Trauma. First shown in Philadelphia, the show combines film with live music, theatre, and gaming, resulting in a cinematic ARG (alternate reality game). While the film is shown, a live soundtrack is performed (past performers have included Marshal Allen (Sun Ra), Espers, and Bardo Pond) on top of the film’s dialog and sound effects; meanwhile, props and sets from the movie are strewn throughout the theatre and characters from the movie emerge through the audience for live action shows throughout the film. Extending the experience beyond the theatre, the film also projects a phone number intermittently through the film. Viewers are encouraged to call the number to start a game that last through the film’s duration and even follows them home. Participants receive clues to solve a set of riddles, and interact with Head Traumacharacters through phone calls and text messages that lead players to more clues online. 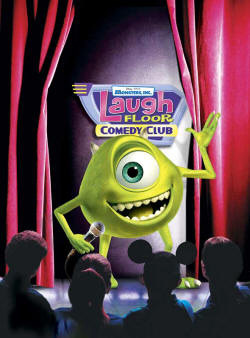 The competition for your entertainment dollars is fiercer than ever. To win your attention, entertainment marketers are finding ways to turn what used to be a TV show or an album or a movie into an interactive, multi-channel entertainment experience. “Let’s say the ad campaign had a cost of $10,000. It got 2% of the people into the store. That means 98% of the ad audience did not come to the store and 80% of the people that came to the store walked out of the store without buying. He spent $10,000 but only $1960 actually drove customers to a purchase. What a collosal waste!” (note: I’ve asked Wolf to explain how he got to $1960. I calculated the figure to be $40, but what do I know). I think the biggest opportunity for organizations, and retailers in particular, to differentiate, is to focus significant resources on the delivering exceptional customer experiences. That starts with asking customers what they want. It also requires you to address those elements in the experience that are sources of dissatisfaction. In fact, you will have limited success until you do this. Word of mouth is a powerful thing and customers will tell others about great experiences. They will also tell others about bad experiences and what’s worse, those friends will tell others. For retailers who routinely misses customer expectations, spending money on push marketing is like trying fill a bucket that has a big whole in the bottom. The best you can hope to do is keep some water in the bucket. Diverting that money to improving the experience of those who do come to your store will result in a higher close rate and higher loyalty and that’s where the real ROI is.